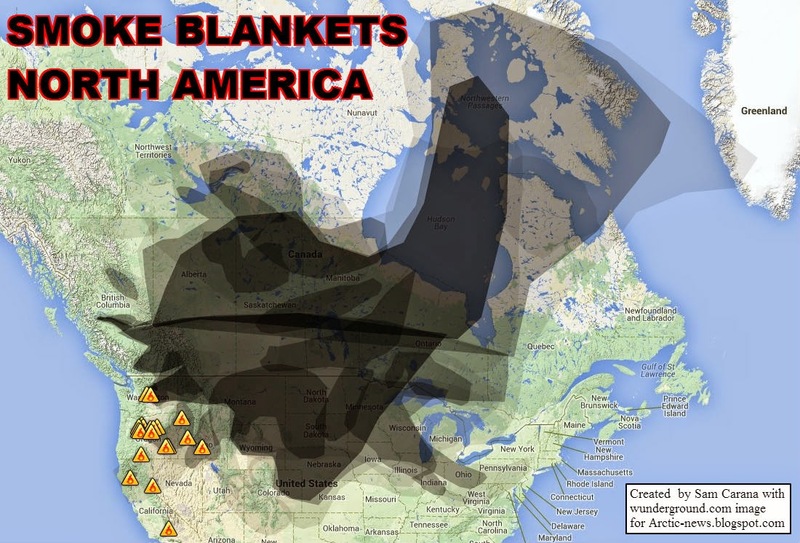 A thick layer of smoke blankets large parts of North America, as also illustrated by the animation below based on images from July 15 to 18, 2014, from Wunderground.com. The are also extensive wildfires throughout the boreal forest and tundra zones of Central Siberia in Russia. Such wildfires can send huge amounts of carbon dioxide, methane, soot, dust and volatile organic compounds into the atmosphere. Much of this gets deposited at higher latitudes, discoloring land, snow and ice, and thus speeding up warming by absorbing more sunlight that was previously reflected back into space. Soils at higher latitudes can contain huge amounts of carbon in the form of peat, as described in the earlier post The Threat of Wildfires in the North. There are further conditions that make the situation in the Arctic so dangerous. The Arctic is particularly vulnerable to warming due to geographics. Seas in the Arctic Ocean are often shallow and covered by sea ice that is disappearing rapidly. Largely surrounded by land that is also rapidly losing its snow and ice cover, the Arctic Ocean acts like a trap capturing heat carried in by the Gulf Stream, which brings in ever warmer water. Of all the heat trapped on Earth by greenhouse gases, 90% goes into oceans, while a large part of the remaining 10% goes into melting the snow and ice cover in the Arctic, as described in an earlier post. 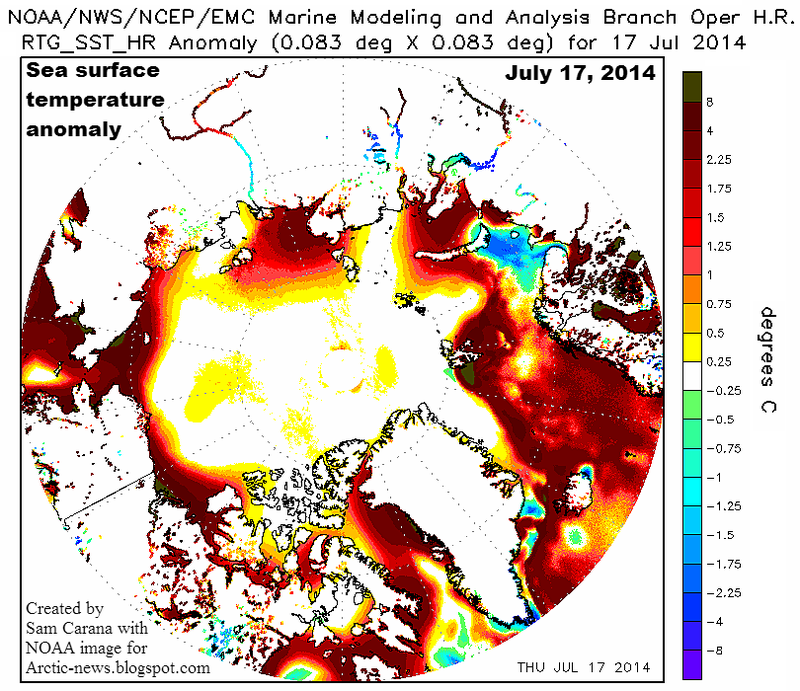 Such basic conditions make that the Arctic is prone to warming. Then, there are huge amounts of methane held in sediments under the Arctic Ocean, in the form of hydrates and free gas. Unlike methane releases from biological sources elsewhere on Earth, methane can be released from the seafloor of the Arctic Ocean in large quantities, in sudden eruptions that are concentrated in one area. Until now, permafrost and the sea ice have acted as a seal, preventing heat from penetrating these methane hydrates and causing further destabilization. As long as there is ice, additional energy will go into melting the ice, and temperatures will not rise. The ice also acts as a glue, keeping the soil together and preventing hydrate destabilization from pressure changes and shockwaves resulting from seismic activity. Once the ice is gone, sediments become prone to destabilization and heat can more easily move down along fractures in the sediment, reaching hydrates that had until then remained stable. When methane escapes from the seafloor of the Arctic Ocean and travels through waters that are only shallow, there is little opportunity for this methane to be broken down in the water, so a lot of it will enter the atmosphere over the Arctic Ocean. The Coriolis effect will spread the methane sideways, but latitudes over the Arctic are relatively short, making the methane return at the same spot relatively quickly, while the polar jet stream acts as a barrier keeping much of the methane within the Arctic atmosphere. In case of large methane eruptions, the atmosphere over the Arctic will quickly become supersaturated with methane that has a huge initial local warming potential. Hydroxyl levels in the atmosphere over the Arctic are very low, extending the lifetime of methane and other precursors of stratospheric ozone and water vapor, each of which have a strong short-term local warming potential. 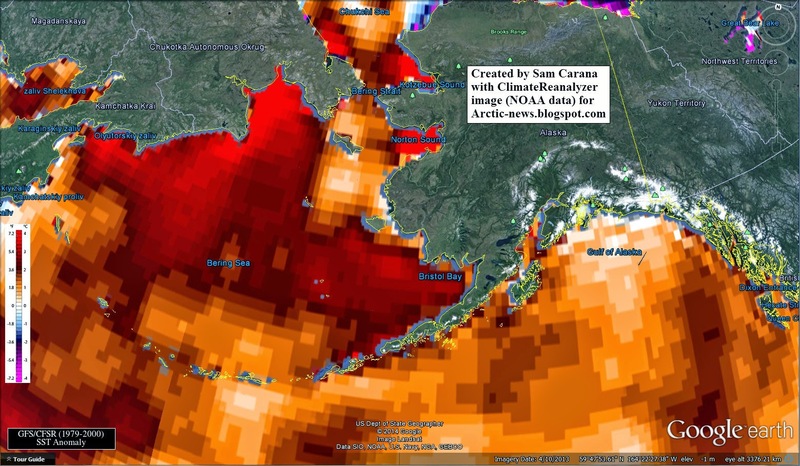 In June/July, insolation in the Arctic is higher than anywhere else on Earth, with the potential to quickly warm up shallow waters, making that heat can penetrate deep into sediments under the seafloor. The initial impact of this methane will be felt most severely in the Arctic itself, given the concentrated and abrupt nature of such releases, with the danger that even relatively small releases of methane from the seafloor of the Arctic can trigger further destabilization of hydrates and further methane releases, escalating into runaway warming. 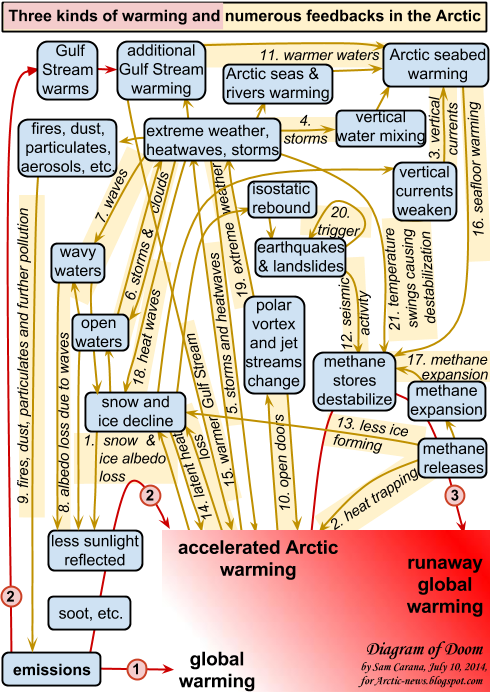 This danger is depicted in the image on the right, showing how albedo changes and methane releases act as feedbacks that further accelerate warming in the Arctic, eventually spiraling into runaway global warming. 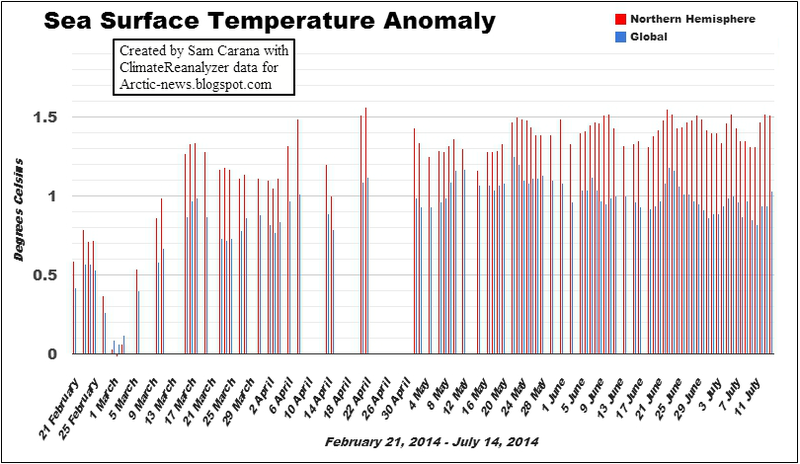 The currently very high sea surface temperature anomalies are illustrated by the two images below. 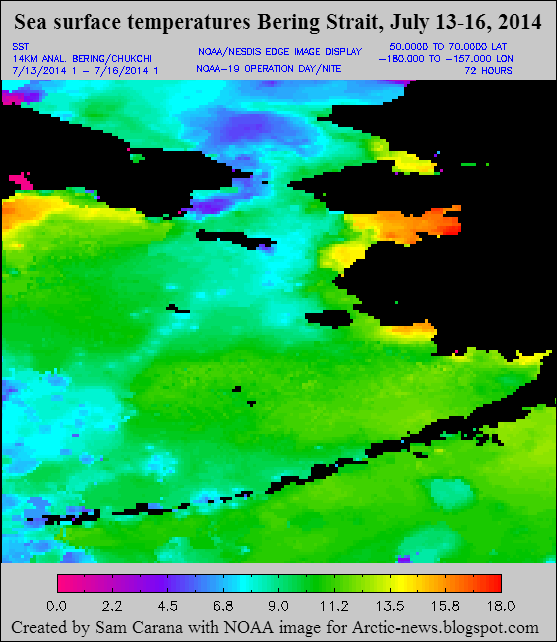 As the image below right shows, sea surface temperatures as high as 18 degrees Celsius (64.4 degrees Fahrenheit) are currently recorded in the Arctic. Albedo changes and methane releases are only two out of numerous feedbacks that are accelerating warming in the Arctic. Also included must be the fact that Earth is in a state of energy imbalance. Earth is receiving more heat from sunlight than it is emitting back into space. Over the past 50 years, the oceans have absorbed about 90% of the total heat added to the climate system, while the rest goes to melting sea and land ice, warming the land surface and warming and moistening the atmosphere. 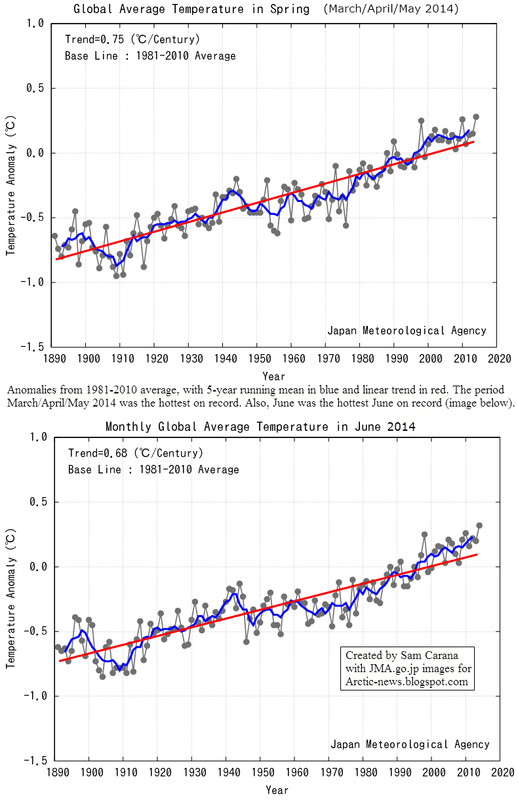 In a 2005 paper, James Hansen et al. estimated that it would take 25 to 50 years for Earth’s surface temperature to reach 60% of its equilibrium response, in case there would be no further change of atmospheric composition. The authors added that the delay could be as short as ten years. Earth's waters act as a buffer, delaying the rise in land surface temperatures that would otherwise occur, but this delay could be shortened. Much of that extra ocean heat may enter the atmosphere much sooner, e.g. as part of an El Niño event. 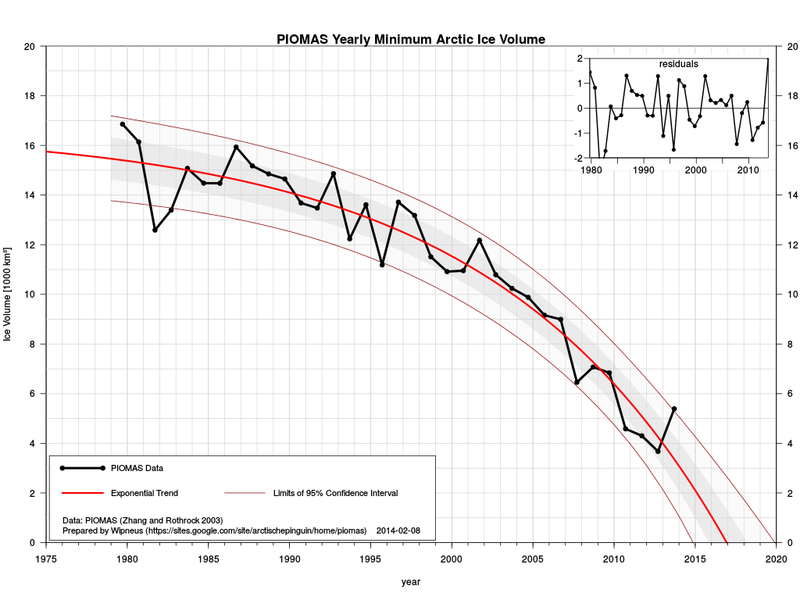 Another buffer, Arctic sea ice, could collapse within years, as illustrated by the image below. 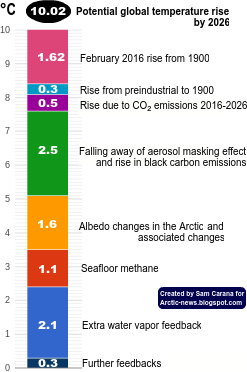 The demise of sea ice comes with huge albedo changes, resulting in more heat getting absorbed by the Arctic Ocean, in turn speeding up warming of the often shallow waters of the Arctic Ocean. This threatens to make heat penetrate subsea sediments containing huge amounts of methane. Abrupt release of large amounts of methane would warm up the Arctic even more, triggering even further methane releases in a spiral of runaway warming. 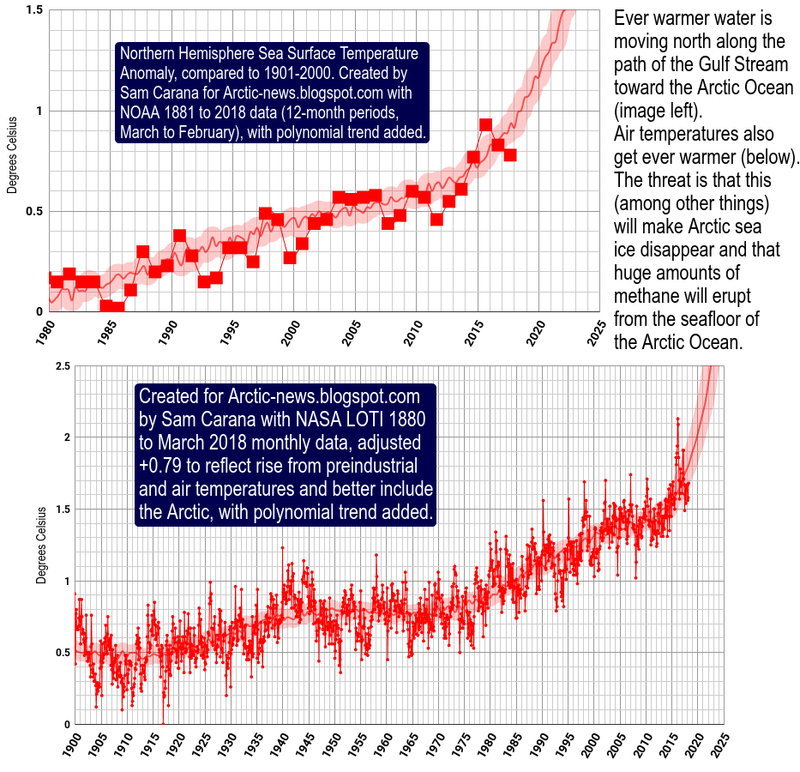 Particularly worrying is the currently very warm water that is penetrating the Arctic Ocean from the Atlantic Ocean and also from the Pacific Ocean, as illustrated by the image further above and the image on the right. The danger is that the Arctic will warm rapidly with decline of the snow and ice cover that until now has acted as a buffer absorbing heat, with more sunlight gets absorbed due to albedo changes and as with additional emissions, particularly methane, resulting from accelerating warming in the Arctic. 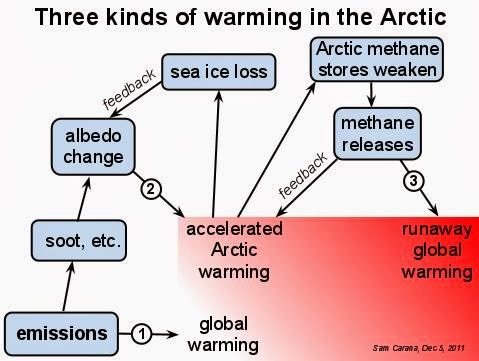 The numerous feedbacks that accelerate warming in the Arctic are pictured in the image below. Furthermore, the necessary shift to clean energy will also remove the current masking effect of aerosols emitted when burning fuel. One study finds that a 35% – 80% cut in people's emission of aerosols and their precursors will result in about 1°C of additional global warming. In the video below and the video further down below, Guy McPherson discusses Climate Change and Human Extinction. 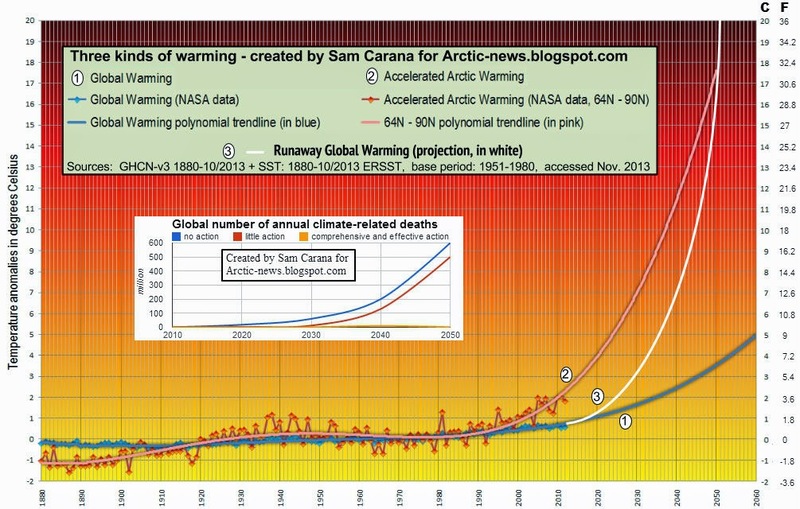 This is further illustrated by the image below, showing how surface temperature rises are accelerating in the Arctic compared to global rises, with trendlines added including one for runaway global warming, from How many deaths could result from failure to act on climate change? Hat tip to Jim Kirkcaldy for pointing at the wildfire development at an early stage. Thanks Paul, I receive many comments and messages daily from people who make important points, and they do deserve more credit. In this case, I've added Jim Kirkcaldy's name underneath the post to credit him for sounding early warnings about the developing wildfires in Canada. There are many more contributors and supporters who deserve more credit, but if they want to, their choice to remain anonymous will be honored.